Which CRM companies are ready to dance with VRM? Early on at ProjectVRM, we had a community meeting in at Oracle headquarters in Silicon Valley, where some VRM-friendly Oracle employees had kindly found us some space. During the meeting we got a surprise visit from Anthony Lye, then the Senior VP of Oracle CRM and later VP of Cloud Applications there. (He has since moved on.) We had a good conversation, after which one of the employees who hosted us disclosed that Anthony had earlier said “Whoever wins at VRM wins at CRM.” It was encouraging to hear, but I never got the quote confirmed, so I don’t know if he said it or not. But I still believe it’s true, because CRM needs VRM for the same reason that companies need customers: the market is a dance floor and it takes two to tango. Other VRM development categories (e.g. code bases, trust frameworks, infrastructures, consortia) lie underneath those two, or blur across them. Still, friendly as Oracle seems, I don’t hear them asking to dance with anybody doing VRM yet. Ten fastest growing CRM vendors as measured in revenue Annual Growth Rate (AGR) in 2012 include Zoho (81.2%), Hybris (78.6%), Teradata (70.4%), Bazaarvoice (56.2%), Marketo (54.3%), Kana (44.2%), Demandware (43.9%), IBM (39.4%), Technology One (37.1%) and Neolane (36%). Communications, media and IT services were the biggest spenders on CRM in 2012 due to their call center requirements. Manufacturing including Consumer Packaged Goods (CPG) was second, and banking & securities were third. If anybody from any of those companies (or the bigger CRM companies on the list above) wants to come out here on the floor (or sit at the table), let us know. We’re patient, and we know you’re coming. * The original source of the graphic, Ray Wang points out in the comments below, is Esteban Kolsky. And, as I say in my comment below Ray’s, I did hear that from my friend Nitin Badjatia at Oracle (and formerly of Right Now), but didn’t remember it when I wrote this piece and the one before it yesterday. Again, it is the verbs — BUY and OWN — that make the image especially useful for VRM, because they are the customer’s. I don’t yet know if those verbs are Esteban’s or Right Now/Oracle’s. Let me know and I’ll give credit where due. They aren’t ready. They live in a world of transactions. 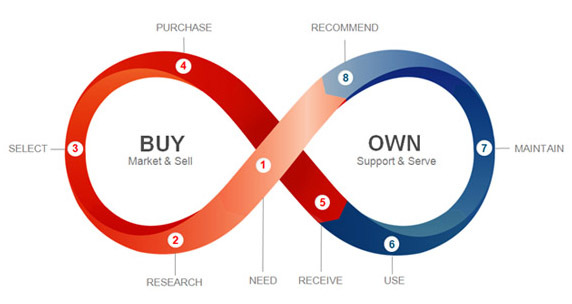 AS a side note, the infinite customer experience model that you seen above was first coined by Esteban Kolsky and literally stolen by the RightNow team before it was brought to Oracle. Thanks, Ray. You’re clearly right that they aren’t ready, because they live in a world of transactions. So, in fact, does most of business — especially big business — late in the Industrial Age, which is very much still with us. It is the Age of Transaction. I suppose we hope through VRM to herald the Age of Relationship, but in fact we had that already, through the history of civilization up until Industry won the Industrial Revolution, after which growth and scale were the only measures of success. The Internet changes that. So does personal computing. Both, together, in every person’s pocket, changes the ground under all of business. That ground, increasingly, will be the customer’s as well as that of the world’s businesses. This fact hasn’t yet sunk in, because customer-side tools for independence and engagement are still in their formative stages. But once those tools get real, and customers acquire full agency, the companies of the world will want to dance with them. Whether CRM will be ready for that is another question. As for the image, my own source for it, Nitin Badjatia (now of Oracle, and formerly of Right Now) did tell me the name of the original creator of the image. I just didn’t remember it when I wrote both posts yesterday, each in a great hurry. So I’ll add the credit to this post and the last one. Meanwhile, now that I have Esteban Kolsky’s name, and his characterization of the image as a continuum, I can search for places where he is credited, such as this post by Chuck Shaeffer at CRMsearch, about Oracle’s CRM. And this one by Emanuele Quintarelli in The Social Enterprise. Others, such as this one by John Kembel, show the graphic, but miss the original provenance of it, being two degrees removed from it. That said, I still want to credit Right Now/Oracle for putting those two verbs — OWN and BUY — inside the two loops. I can’t find any places where Esteban did that; though maybe he did, and if so I’ll be glad to credit him with that too. It is this pair of verbs, even more than the figure-8 continuum, that make the loops useful for VRM. Their readiness, at a decision-maker level, is dependent on sufficient market demand to provide a valuable pivot. This relies on factors exogenous to their operations, which will naturally supply the leverage to change (if VRM assumptions reign true). Our data locker technology has the ability to update or revoke data from CRM when a user ends the permission with an organization – so the work is being done as we speak. The leverage I describe above will build up over time as users of CRM begin integrating technologies such as ours. Integration will accelerate as consumers become more aware of their digital identities and seek solutions to own and manage them. Are they ready? Smart decision makers are always ready. Timing is everything. Thanks for weighing in, William. Do you see Solomo as a CRM system, a VRM system, both or neither? On the Identity side (consumer app), it could be described as a VRM system. On the Geo side (B2B web services), it is an indoor LBS and offers/content engine. And thank you, Doc, for both your thought leadership and asking that clarifying question. Thank you for raising interest on the VRM concept, I did not know there was a name to this! It seems indeed promising for companies to increase communication between each other’s.